I have no clue who is Mirror Man, his favourite sneakers or preferred pasta are unknown. Actually any details about the artist allegedly using another, quite well-known moniker are hard to find, except that some months ago Mirror Man struck with “Curse Of The Green Goat”, a podcast for Berceuse Heroique, and now the Bio Rhythm single is the vinyl debut. 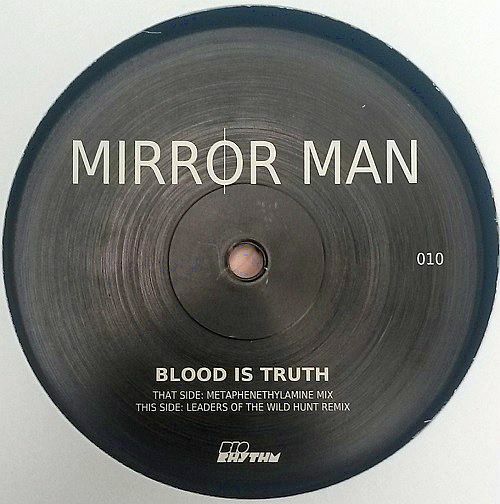 The Metaphenethylamine mix of “Blood Is Truth” is a heat-seeking missile propelled by restless cymbals, ample snare drum and bumblebee bass line. It will be applauded by Ekman fans as it reminds of the less vitriolic tracks of the Dutchman. In a less monotone note comes The Leaders Of The Wild Hunt remix on the flip. Keeping the foundations of the previous cut, it adds giallo-style suspense to the game when supplementing the initial hardware rage with strings and steel brush riffs. A banging release, in its own way.